The Georgetown, Texas local history museum sponsors the Old West festival with cowboys in period correct attire as they ride herding longhorn cattle along the San Gabriel riverbanks. Part of the Festival includes a full Rodeo of Barrel Racing, Bronc Riding, Roping Events and Bull Riders. Other activities range from live music entertainment, trick roping, the western art show and a day of cooking from the Chuck Wagons that come from around the nation to participate in the Up the Chisholm Trail Chuck Wagon Cook-Off. Named for Jesse Chisholm, the trail developed as a trading route where Jesse built several trading posts in what is now western Oklahoma. The trail naturally became a route spanning from the Fleetwood Store along the banks of the Red River running north to Abilene, Kansas. 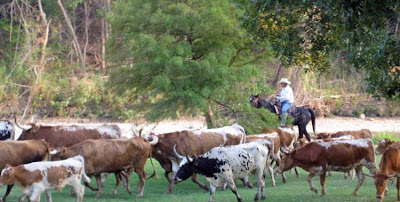 Feeder trails south of the Red River began being use to drive cattle herds from the many major cities of Texas running to border towns of Laredo and Brownsville flowing into central Texas. The trail centered between two other famous routes running north and south. The Great Western Trail of west Texas and the Shawnee Trail that met the finger trail of the Chisholm a few miles north of Waco, Texas that branched through eastern Oklahoma and Kansas. Other branch lines linked through other territories and states. The Longhorn cattle at $4 a head were worth ten times that amount to northern states and back east. Cattle drives had long moved herds from Texas to New Orleans, Louisianan and Mobile, Alabama though these cities could not handle any large quantities of the cattle. By 1853, Texans moved herds to Missouri that would later be blocked from worries over diseases that Longhorns may pass on to local breeds. The troubles sprung into violence, vigilante groups, and cattle rustling. By 1859, the driving of cattle was outlawed in many Missouri jurisdictions. At the end of the civil war, the Longhorn cattle thrived in south Texas. At the birth of the trail drives in 1866, many men became powerful cattle barons. Charles Goodnight, Oliver Loving, Jesse Driskill, Richard King are among those building fortunes selling beef. The trails where dangerous often crossing through Indian territory, dealing with bandits, rustlers and inclement harsh weather yet the cattlemen pressed forth. In 1867, Joseph G. McCoy built stockyards in Abilene, Kansas. He encouraged Texas cattlemen to drive their herds to his stockyards. That year, O. W. Wheeler answered McCoy's call, and he along with partners used the Chisholm Trail to bring a herd of 2,400 steers from Texas to Abilene. This herd was the first of over an estimated 5,000,000 head of Texas cattle to reach Kansas over the Chisholm Trail. Jesse Chisholm died in 1868 never traveling the trail which would hold his name in the age of the great cattle drive. The Georgetown, Texas event, "Up the Chisholm Trail Cattle Drive and Chuckwagon Cook-Off" is to educate the public about the rich heritage of the nineteenth-century cattle drives and the lives of the cowboys who worked the trails rounding up herds along the San Gabriel River. 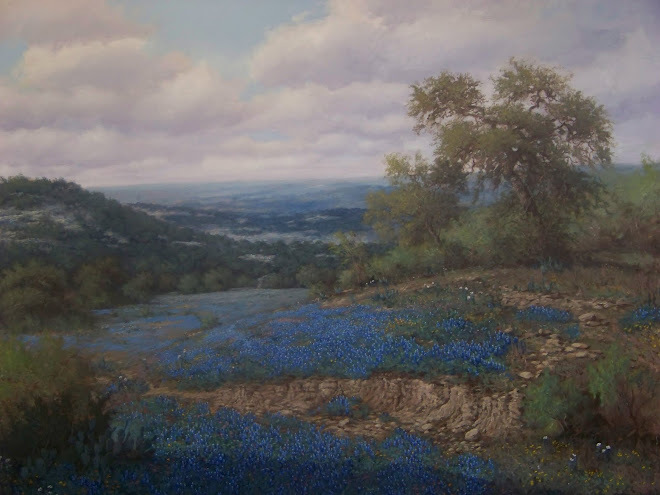 Resting 30 miles north of Austin, Texas, Georgetown attracted many early American settlers. While many European immigrants settled the area, a large number where German and Swedish pioneers. The terrain was abundant with timber, inexpensive fertile land and clear water where artifacts today still show traces of Paleo-Indian culture dating to around 9200 B.C. Additional artifacts have been found from other Indian cultures, the Tonkawas, small groups of Kiowa, Yojuane, Tawakoni, and Mayeye tribes with the first Anglo settlements in the area. Georgetown, Texas is the county seat of Williamson County. One of the many vendors during the festival was Texas Longhorns for Hire owned by Diana Tatum. Her Longhorns for hire allow individuals who have never had the opportunity to be next to a real Longhorn an experience to get up close and personal. Her two steers, Gateway and Hotshot mounted with saddles allowed the visiting public to ride high in the seat and have the pictures taken. Erin Jones with Double E Photography, Houston, Texas assist Diana taking pictures for a fee while you proudly sit in the saddle mounted upon the Texas Longhorns. 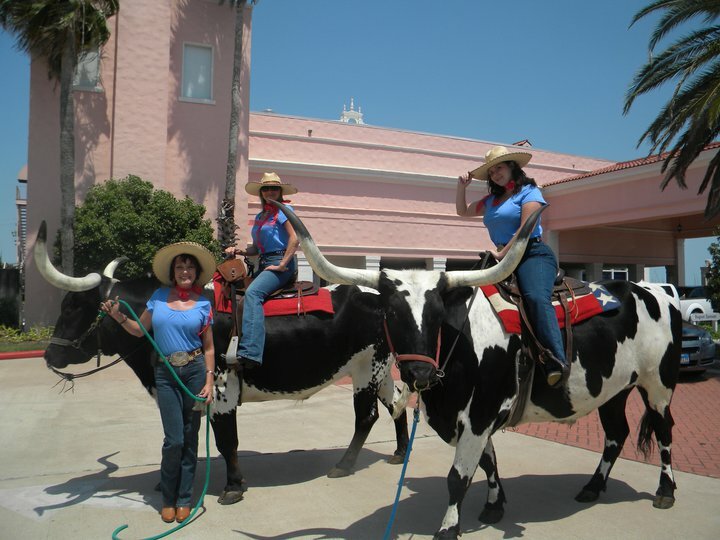 Diana also helps provide profession event planning with the Western theme. The weekend was filled with many children events including the Kids' Chuckwagon cook-off competition. There were 10 young cooks competing for the grand prize as they teamed with sponsored chuckwagons to make the best peach cobbler dessert to feed a minimum of 40 people. Ages allowed to compete in the event were from 10 years old and not to exceed 15 years of age. Victoria Kainer cooking with Bertie Bell was awarded first place receiving $50; 2nd place winner Lauren Red and Aubrey Gibson with Team Wishbone received $30 and 3rd place was Lance Rakowski cooking with R Bar D Chuck wagon team. Saturday morning found the Cowboys adding wood to the camp fires as they prepared for the annual Chuck Wagon Competition event. To ensure competition is fair, using certain ingredients in cooking styles was not permitted including, mushrooms, biscuit mix, cheese, powder sugar, Mayonnaise, Chili mixes, Froze foods, Almonds, extract, Picante sauce or any sugar substitutes. Cast iron skillets begin to be pre-heated, dutch ovens waiting on the work table to prepare the meat, potatoes, beans, biscuits and dessert dishes. The cooks and crew work sourdough blending trade secrets past on from generation to generation as each Chuck Wagon team works toward the Gold as Grand Champions. Charlie and Janice Ellis from Papalote, Texas have been crating from nearly a decade. 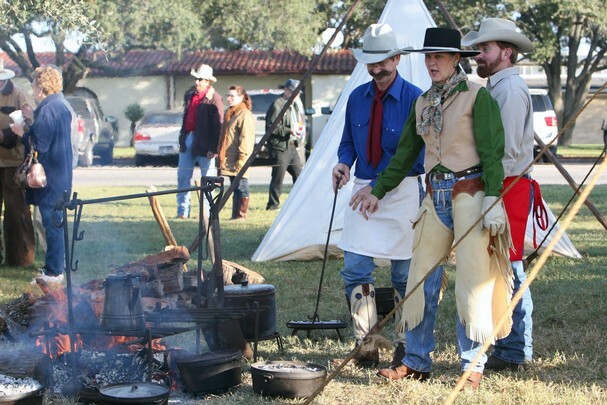 They love participating at "Up the Chisholm Trail Cook-Off" since they reside in south Texas. They try to attend at least three events each year along with the Ranch Hand Breakfast each November held at the renown King Ranch. By late afternoon, guest have been fed. The judges Aubrey Lenamon and Gerry Self review their notes about the savoring taste from earlier samples of each wagon crew. Other attractions to the events included living history groups from Buffalo Soldiers, gun fighters who reenacted during the day, blacksmith's share their knowledge and skills forging pieces from the past using authentic equipment dating over 100 years old and the History of the Wild Mustang from its Spanish origins. Kids had opportunities for Stick horse racing, branding, tossing the snake in the boot, horse show throw in addition to the parade and big night at the Rodeo. 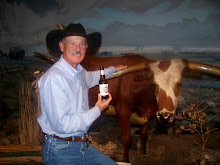 "Roger enjoys his Lone Star with Texas Longhorn BEVO"